In the last decade, there has been a steady increase in the number of “temporary foreign workers” who come to work in Canada under free trade agreements. 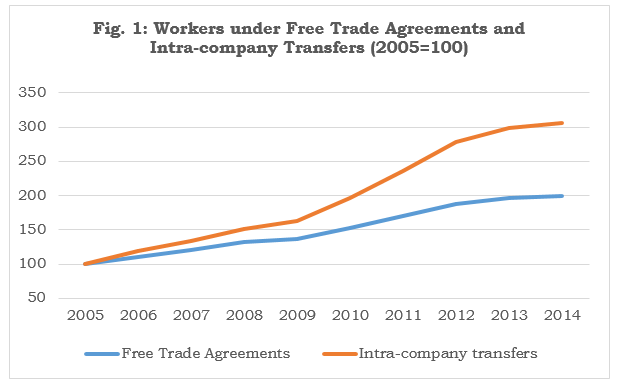 Between 2005 and 2014, free trade agreement workers have doubled and intra-company transferees have tripled. (see Fig. 1) Back in 2013, there was a huge public outcry when the Royal Bank of Canada (RBC) replaced Canadian workers with intra-company transferees. Free trade agreements, such as North American Free Trade Agreement (NAFTA), contain labour mobility provisions that increase access for higher-skilled workers and business personnel from signatory countries to work temporarily in Canada. The Trans-Pacific Partnership (TPP) and Canada-European Union: Comprehensive Economic and Trade Agreement (CETA), which are concluded agreements but not in force yet, also have labour mobility provisions. The TPP, that includes the USA and Mexico, essentially replaces NAFTA but provides labour mobility provisions to nine other countries; and CETA would provide labour mobility access to an additional 28 countries in Europe. Last year, there were 40,487 workers entering Canada under the free trade agreements that are in force: 37,937 NAFTA workers, 2,165 workers under the remaining nine free trade agreements, and 448 General Agreement on Trade in Services (GATS) workers. In the last decade, NAFTA workers have consistently accounted for the lion’s share, amounting to, on average, 93% of those working temporarily in Canada under free trade agreements. Other FTAs similar to the NAFTA: Work permits may be issued for one year, with renewals by one-year increments. Last year, there were 27,596 intra-company transferees working in Canada. International companies can transfer their employees to Canada temporarily to contribute their expertise that will provide “significant economic benefit” to Canada. Intra-company transferees come under the Immigration and Refugee Protection Regulations (IRPR) while entry of some transferees are supplemented by free trade agreements provisions. The Canadian government does not distinguish between these two categories of transferees in their data. Specialized knowledge transferees: Initial work permits may be issued for three years maximum, one year if opening an office with renewals by two-year increments; total period of stay may not exceed five years. Lastly, it is important to note that all “temporary foreign workers” in Canada come under two separate immigration streams: the International Mobility Program (IMP) that does not require a Labour Market Impact Assessment (LMIA) to ensure that no Canadian or permanent resident is available or wants to fill the position; and the Temporary Foreign Worker Program (TFWP) that requires a LMIA. In 2014, there were a total of 330,898 IMP workers in Canada, and 177,704 TFWP workers for a total of 508,602 international migrant workers. Free trade agreement workers and intra-company transferees accounted for 20.6% of all IMP workers last year. The TPP, which is not in force yet, does not specify a cap or limit to the number of international migrant workers that may be allowed to work in Canada. Since the IMP program is LMIA exempt, information is not systematically collected and available about the workers from free trade signatory countries such as their occupation or industry. Without this information, it is difficult to ascertain how they significantly benefit Canada.